The others are going to change inside the palace which Maxima usually does too. Don't know why she arrives already in full attire today. Why does the king look like he's dressed for a picnic and the queen for a gala? I wonder the same thing. Doesn't look like they're going to the same event. Je me demandais la même chose. La reine Maxima a l'air tout droit sortie d'un concours de reine de beauté, genre Miss Univers, tandis que le roi, a le costume idéal pour un lunch à un sports club! I'm wondering about that. As for Maxima, her hair is disgusting. His Majesty normally doesnt arrive all dressed, everyone changes inside the palace before the gala. My eyes went straight to Maxima, WA didn't get a look in until I read the comments! okay, so only Maxima is dressed for a gala. With a tiara! And she looks lovely! Gee did Maxima overdress? King is casual and so is Princess Beatrix, no tiara for her nor an evening gown. That big sparkling whopper on her head demands a formal updo not loose hanging hair. Absolutely - what a shame she does not have her hair appropriately done for the tiara. My thoughts exactly! It's like they are dressed for two completely different events​. Maxima is looking as always for evening events! Etes vous obligée de faire paraître CETTE PHOTOdecla princesse Beatrix ? Well Myriam, that's her face. Okay now with more pictures it makes sense and Maxima doesn't look completely out of place. 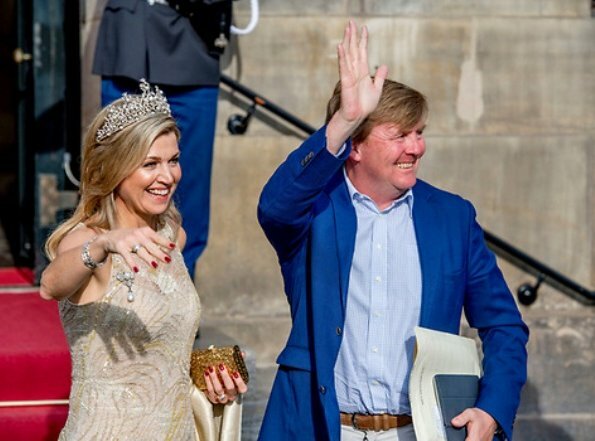 :) I love the tiara Maxima is wearing. The Dutch royal family sure has some magnificent jewellery. Very funny Royal Queen!!! But the extraordinary suits her. Words I never thought I would write, I think the tiara Maxima is wearing is too big.